The many different ways of investing money is one major reason that investing is so confusing. Even if we both agree that investing is a process, we will both define that process in a different way, based on our personal needs and experiences. As stated on my home page, investing is a decision making process and the choices you make will determine whether you are being "safe" or "risky" with your money. All the decisions you make effect one another. For example, if you decide to use fundamental analysis techniques, the types of investments and strategies you can use successfully are narrowed down. In order to invest safely, you need to pick a strategy, instrument, account/broker, and technique that all work together. In other words, you need to figure out why you're investing, what your investing in, where you're going to put your money and who is going to manage it, and when you are going to buy and sell. I tend to be a visual learner, so I put together a sequence of pictures that showcases how your choices get narrowed down. Imagine that you've written down every single investing strategy inside a circle. 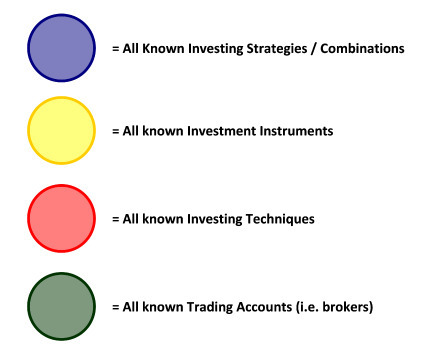 An average investor picks an item from each circle independently. In other words, these investors don't know that these circles are connected. And the end result is higher risk...and we haven't even invested 1 dollar! Personal investing strategies are driven by your personal finance goals. For example, if you are trying to create a second source of income from your investing activities, then you naturally need an income investing strategy. There are only 2 investment strategies that matter. Follow this link to learn more. When choosing investment instruments, most people only consider stocks, bonds, and maybe real estate. There are actually MANY more investment tools at your disposal, but the differences between them can be arbitrary at times. As you can see from the picture above, there is a select group of investing strategies and investment instruments that support one another. For example, if you want to use an income strategy, make sure that the instrument you select provides some form of income on a recurring basis. Click here to learn more about the investment instruments available to you. Selecting an investment account and/or an investment broker is an important decision, and influences which techniques and investment tools you can use. For example, an account may have minimum balance requirements or limit to the number of trades over a certain period of time. In addition, a broker may not be a member of every market, or could have high commission rates. The second decision concerning trading accounts and investment brokers is who will manage your account. As stated on the safe investing principles page, you are responsible for your money, so "Minding your business" is always the best policy. This applies regardless of whether you actually enter the trades yourself or have a representative do it for you. This link will take you to the Trading Accounts page. For more information on Investment Brokers, click here. Selecting an investing technique is just as important as your investment instrument or trading account. And the large number of techniques only adds to the difficulty and confusion most people face. Essentially, all investment techniques acts as filters, allowing you to weed out investments that do not meet your selection criteria. You may decide that you will not purchase investments that have a P/E Ratio below 10 (Fundamental Analysis Technique) or a daily trading volume less than 300,000 shares (Technical Analysis Technique). To learn more about the different investing techniques, click here. You've probably noticed that the intersection between the different areas (inside the white lines) grows smaller with each set of decisions you make. 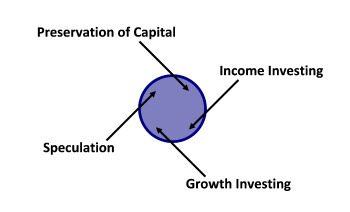 This represents the fact that all the different ways of investing money are connected and influence each other quite a bit. This is why it is so important to have a game plan before investing a single dime. You need to make sure that everything is aligned with your goals, even if you end up having someone else execute the strategy.